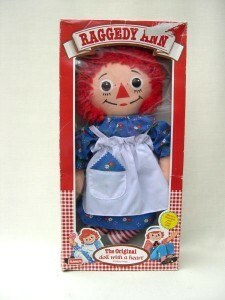 Raggedy Ann Dolls are one of the great American classic dolls. 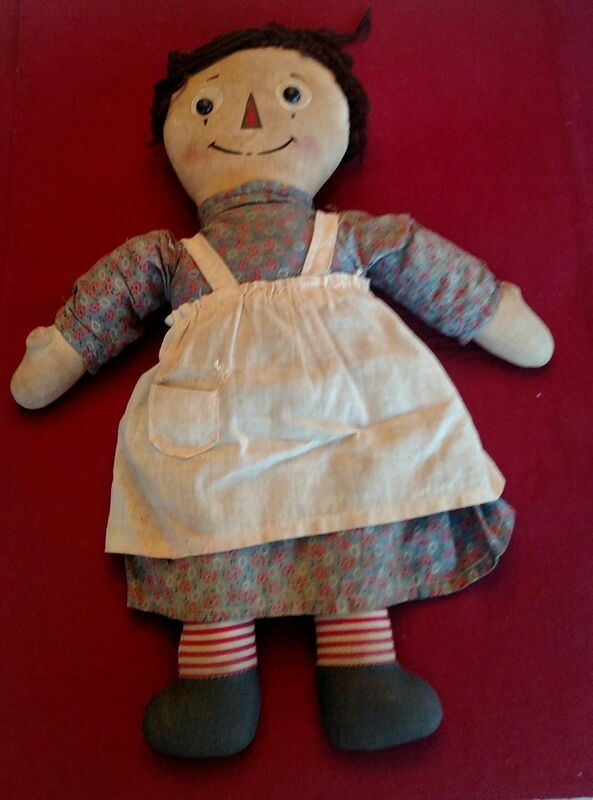 Instantly recognisable with her beaming smile, red triangular nose and round black eyes, Raggedy was originally a storybook doll. Johnny Gruelle Raggedy Ann & Andy original pencil and crayon drawing signed by the artist image 245 x 210m. Sold for £700 at Bloomsbury Auctions, October 2010. 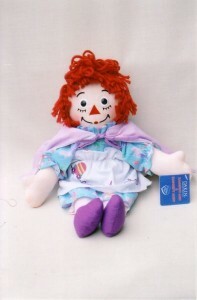 Unlike the majority of dolls which are devised purely for commercial reasons, Raggedy Ann was created for the nicest reason of all – she was created through love. Her creator was an artist and storyteller called Johnny Gruelle, who told the tales and drew the delightful pictures to entertain his small daughter when she was ill – or so the story goes. However, the anecdotes woven around the creation of this charismatic doll have become embellished, contradicted and disputed over the years, so no-body really knows for certain. Johnny’s small daughter was named Marcella, and one anecdote has it that while she was playing in the attic she discovered an old cloth doll with a faded face, which had belonged to her grandmother. Her father drew a new face onto the doll, and it was she who became immortalised as Raggedy Ann. Marcella was enchanted, and from then on, Raggedy Ann became her constant companion, inspiring her father to tell stories to the little girl about her doll. Tragically, Marcella died when she was still quite young from a smallpox vaccination which became infected, and it was then that Johnny took the decision to publish the stories which she had loved, for other children to share – it was his tribute to his daughter. 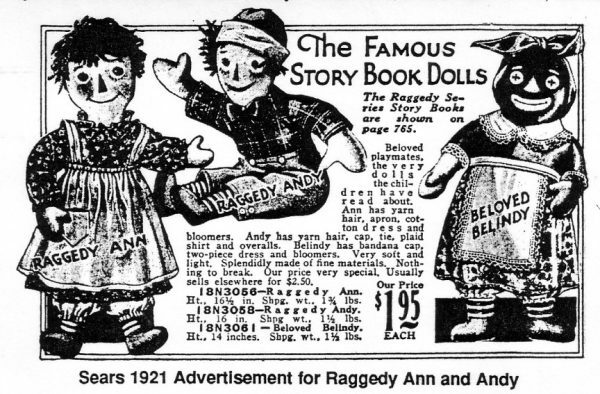 He patented and trademarked the Raggedy Ann design in 1915. Over the years, numerous editions of the books have appeared, though they have never been as popular in Britain as they are in the United States. Other characters have been introduced too, perhaps the most famous being her brother Raggedy Andy, Beloved Belindy, Uncle Clem and the gloriously-named ‘Camel With Wrinkled Knees.’ The stories tell how Raggedy Ann, a sweet kindly doll – because she has a candy heart – comes to life when humans aren’t around, and has great adventures with her brother, Andy. First in the series was ‘Raggedy Ann Stories’, which was published in 1918 by the P. F. Volland company, who later followed up the success with a character Raggedy Ann doll. The rest is history. More stories followed; Raggedy Ann’s Magical Wishes, The Paper Dragon, Raggedy Ann in the Deep Deep Woods and Raggedy Ann and the Left-Handed Safety Pin amongst many, many others. 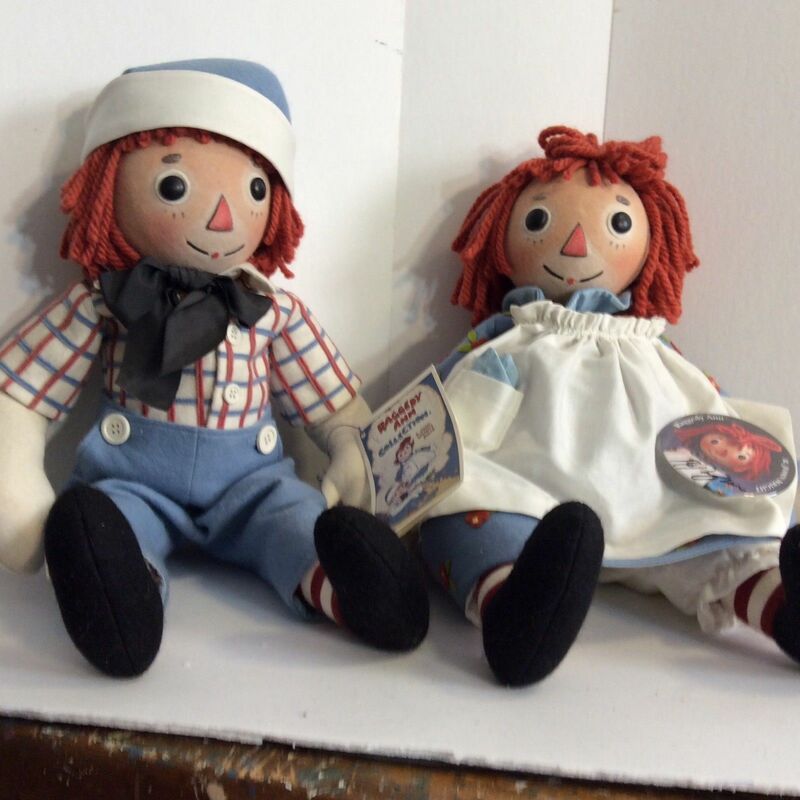 Raggedy Ann dolls have been made for almost as long as the books have been published. 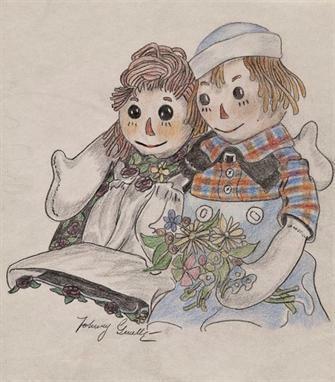 Apparently Johnny Gruelle persuaded his family to make some cloth dolls to accompany the earliest of the books, maybe for shop display purposes, we can’t be sure now. One delightful rumour said that each doll was given a candy heart which read ‘I Love You’, just as Raggedy Ann has in the story books. So far, this hasn’t be proved – old dolls don’t seem to contain any remnants of candy, though it is a charming idea. 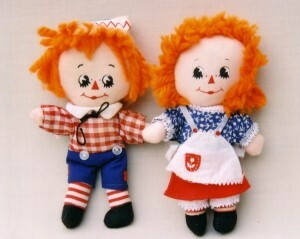 The early Raggedy Ann dolls often had brown hair, and less of a caricature face than later Raggedy Anns. Volland dolls were made during the 1920s and 30s, and many are highly prized, while even those from some of the later companies, Knickerbocker for instance, are increasing in price, especially in America where Raggedy Ann is one of the most famous character dolls. In Britain, she is much less-widely known, and frequently gets muddled with the ‘Orphan Annie’ character who later became the star of a musical and movie. 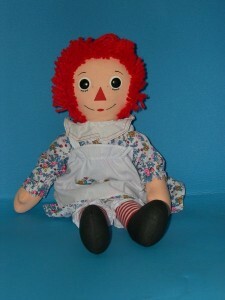 Raggedy Ann is often dressed in a pinafore worn over a cotton print frock and stripy red stockings. Perhaps the most expensive of the early dolls, occasionally found today, is Beloved Belindy, a plump black doll wearing a headscarf. She appeals not only to Raggedy Ann enthusiasts but to the collectors of black dolls as well. 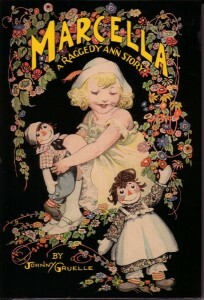 Recently, R. John Wright, the famous creator of exquisite felt toys and dolls, produced a beautiful version of the young Marcella, holding her Raggedy Ann. Standing 17 inches high, the little girl has a pensive expression, and is dressed in a yellow print dress and straw bonnet, which is tied with a wide blue ribbon. She clutches her beloved Raggedy Ann. R. John Wright has also created particularly jaunty versions of both Raggedy Ann and Andy, 17 inches high, made from pure wool felt. He maintains that they are the most authentic Raggedy Ann & Andy dolls ever made. As Raggedy Ann is such a traditional character, and, being a rag doll, is relatively easy to make, thousands of home-made copies have appeared over the years, some of them excellent, others very basic. Beware when you are buying a doll which you haven‘t examined, especially if buying from ebay, because it is all too easy to be fobbed off with a copy. Having said that, many collectors are happy with the copies too, feeling that they are all part of Raggedy Ann’s history. A special museum devoted to Raggedy Ann Dolls opened in 1999 in Arcola, Illinois. Called The Johnny Gruelle Raggedy Ann & Andy Museum, it is the only officially licensed Raggedy Ann & Andy museum in the world. The museum also sells dolls, books and memorabilia. And in 2005, Raggedy Ann celebrated her 90th anniversary, prompting several companies to produce commemorative versions of the doll. Johnny Gruelle, who died in 1938, eventually became known as ‘The Raggedy Ann Man’ – he would no doubt be astounded could he know that his sweet creation was still widely collected and very much loved today. 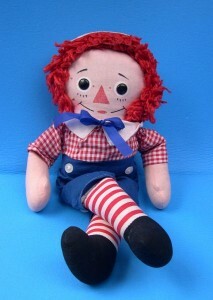 Realised prices at auction give a reflective price and value of Raggedy Ann Dolls. Rare Raggedy Ann Doll, 1920S, Single Lash, Orig Clothing, Dense Cardboard Heart. Sold for $765 on ebay, March 2018. Sold for $650 on ebay April 2018.